A public open house was held on Wednesday, November 28, 2018 at Shoreline City Hall to present the design concept for the Community and Aquatics Center planned on Midvale, near City Hall. Eric Friedli, Director of Parks, Recreation, and Cultural Services, made a brief presentation along with WRNS Studio consultants and City staff, followed by 60 minutes of questions and answers. The room was packed, with an estimated 150-200 people in attendance. Many asked questions about lack of accommodations for high school swim teams and for the senior center. The current budget for the center is $80 M which allows no money for a diving well or competition level swimming pool. No dedicated senior center facilities are planned for the Center. City Council will ultimately set the amount to be spent on the Center and voters will have to approve a bond. The pool planned for the Center will have six lanes 7 feet wide and 25 yards long. The Center will be part of a planned pedestrian area for our city which includes the park in front of City Hall. They plan to keep the historical red bricks. 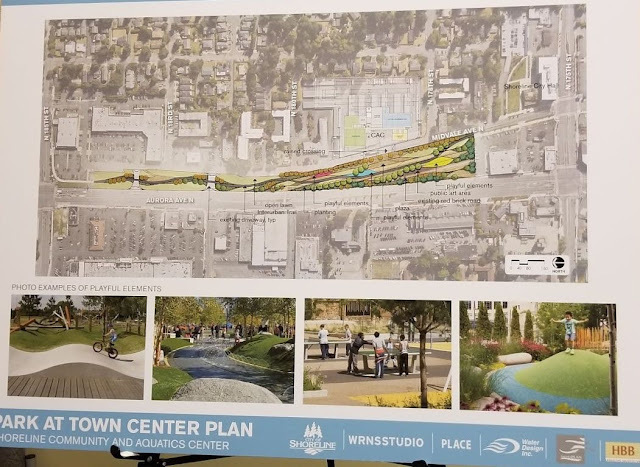 The city plans to revamp the park along the Interurban Trail in this City Center area adding playful centers. The land belongs to City Light, so no permanent structures can be placed there, but there is still a lot that can be done. For the Center, there will be a courtyard in front center of three community buildings. The building on the north side is a gym with a jogging track above. The Pool will be southeast with community rooms southwest. These south area rooms will be more intimate space which will open to a beautiful forested area on the south of property. There will be rooms for community events including weddings. It will be a civic core space to benefit from access from the trail. Based on feedback received during the summer, they are adding a play structure in the courtyard. Also people want the market to come back to the area. The land is in the Boeing Creek watershed and a tributary of Boeing Creek is beneath the area which could be daylighted. The architect showed pictures of the entrance which they like to call the "living room," which will look down into the pool. The entrance will expand through from the front courtyard area to the back doors onto the parking lot. Asked to place the importance of Senior Center, Friedli said "a 10, knowing our audience." The jogging track and community center offers space. "If we had more money, we could add more" similar to facilities at the existing Senior Center. Patron mentioned that the senior center has a commercial kitchen that now serves lunch for $4. Response was kitchen could be added in future, like 10 years. Why do we have to put so much into landscaping and not put more to building a competition level swimming pool? The amount of landscaping has been reduced from the original design and that remaining is not a significant part of the budget. How was the determination made for the design ... Things were put out in neighborhoods. Can there be private donations? Yes of course, but doubtful that we would receive another $20M. Suggestions made to visit the Lynnwood Recreation Center as it was done really well. Another stated to take a look more at Snohomish Center which is much better than Lynnwood. SWHS swim coach Suzie mentioned that they need spectator space for their competitions and no bulkhead, plus eight lanes. Lynn spoke of how swim is one of two non-cut sports in district which is important to kids. 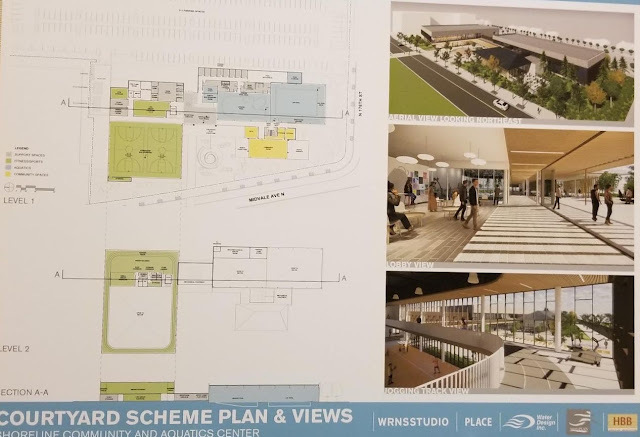 Another stated "Let's not miss the boat here and miss our chance to get what we need now and for the future..."
The Aquatic facility will be bigger than Shoreline pool but yes lap pool is less. The current senior center is run by an outside agency - Sound Generations - who needs to step up with city. Consider an L shape for the pool. Cascade Swim pays lots of money to pools and so surprised not taking that into consideration. Water polo needs 5 feet deep. Now they get pool time at 9pm. Was asked if School District has been asked about project? Eric admitted that the district has been silent and not participating. Several mentioned that they have not received any neighborhood notices of this project. Notices were given to neighbors, Secret Shoreline, workshops, and focus groups from swim groups too. Again not enough money. Open surface structure costs $25,000/spot compared to $2,000 for surface parking spaces. Yes of course can use the City Hall parking down road. Yes that is what we have now at Spartan Gym and it is all used by various different activities (volleyball, pickleball, badminton, jazzerize, and many other activities and events). The budget started at $75M and went up to $80M, it's up to Council to go beyond. Again brought up more about a competition lap pool to accommodate all these four classes of 60 kids. Plus need a diving well. Then a parent of swim student mentioned that we need to get District on board. Someone asked who owns pool. The pool is owned by the city, but the property is owned by the school district. Right now there is a joint operating agreement for pool use with no money changing hands. Asked if we needed all the outdoor space ... The outdoor space responded to what people requested in responses. Asked about property ownership of the new site ... In July Council went to property owner. City Manager is currently negotiating for purchase of property. Asked if surveys covered demographics. Random telephone survey outreach done two years ago. Recently did dots survey at Swingin Summer Eve and Celebrate Shoreline. Eric ended by saying that the current Shoreline pool is very expensive to run. It's the largest natural gas user in the area. Currently its revenue is about $1.2M and the new pool should also bring in $1.2M year in revenue. The City's notes about feedback at the meeting are HERE. The City's information page on the project is HERE. The city keeps telling us that the present pool is very expensive to run and is the largest natural gas consumer in the area. This is just the nature of a large pool. For a given gallon capacity, a boiler will be required to heat water from ambient to the 89 degree pool temperature, no matter whether the water is in the old Shoreline pool or a sparkling new $80M facility. If the city claims that the new pool will save on operating expenses, then they need to give us hard numbers backing up that dubious claim. Considering that the existing pool is still quite serviceable and a less fortunate community wouldn't consider replacing it, the city needs to make a better argument for why we need to tax ourselves. I swim at the pool frequently, and aside from wishing there was a hot tub, I see no reason to replace it. This whole process feels like we're putting in something shiny simply because we're bored. North King County needs a facility that can comfortably host regional swim meets, maximize participation of year-round swimmers, support the non-cut swim & dive teams from both high schools, and attract an increasingly diverse population into the swim community. A dive tank – to support high school swim & dive teams, and allow as many student athletes as possible to participate in non-cut teams.